Counted as first among the best, we provide clients with the superior quality of Proximity Sensors. 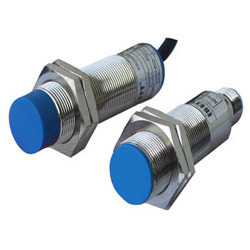 Available with us in both capacitive and inductive type, the proximity sensors are used in industrial applications for detecting metallic objects at an operating distance of up to 50 mm. For manufacturing of proximity sensors, we make use of latest technology.